This article discusses the various methods and tricks used in MVVM, to enable a developer to completely separate the user interface from the code. It demonstrates all the basics with easy examples to follow, in a downloadable project. 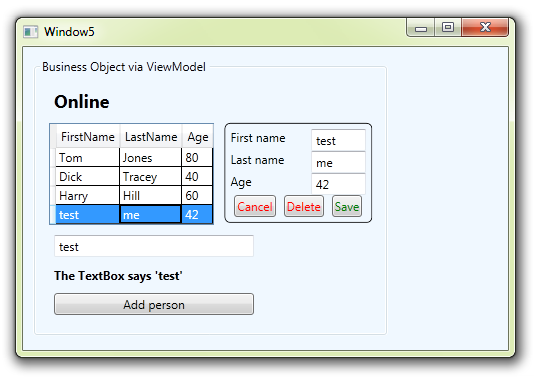 Model View ViewModel is the golden child of WPF, allowing a developer to completely separate their application code from any UI dependencies. This means an application can be easily be re-skinned, and it also makes an application much easier to test. The View represents any front-end user interface controls (Window, Page, UserControl), the Model represents the classes used in the application, and the ViewModel is the middle-man that requests, molds and exposes the data, as properties and commands. This is article is linked to a TechNet sample project that you can download and explore. It covers many basic concepts of MVVM, and some of the common pitfalls and solutions. The idea is to download the sample, run it to see each example, then read through this, along side the code. If you're looking for more good WPF examples, you will probably enjoy my other Gallery sample projects. all I ask is that you rate (star) them, thanks. This base class contains the common code used by all properties of all other derived ViewModels, one is shown below. As you can see, it looks like a standard CLI object, but with the extra RaisePropertyChanged method in the setter. 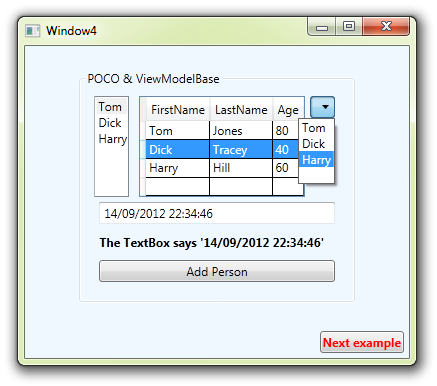 In example 1, the ViewModel is attached by the View itself, in XAML. Notice this is possible because the ViewModel does not need any parameters in it's constructor. There is a ListBox, DataGrid and ComboBox, ALL with ItemsSource to the same collection, and the same SeletedItem. Changes to the values of any of the properties in the DataGrid are reflected across all controls. As you change the selected Person in any of these controls, you will see all three change together. A TextBox and TextBlock share the same property, so changes in the TextBox reflect in the TextBlock. Click the button to add a user, it shows in all three controls. Although many would think that this is all due to our 'enriched' INPC classes, most of this is actually triggered by changing the values through the UI, as explained later. Only the Add user command relies on PropertyChanged events, and they come from the changing ObservableCollection. A traditional method of triggering functions and navigating from one window to another is using code-behind event handlers. This means your code is tightly coupled with the user interface. The most common first question in MVVM is how to call methods of a control like Window.Close() from a ViewModel. This is shown in the next example. 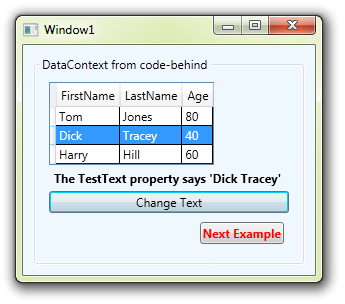 The second example simply shows how you can attach the ViewModel to the DataContext from code, done by the previous window shown above, as this window was created. This ViewModel is derived from ViewModelMain, with an extra public property and command to pull a value from the base class and update this new property. The Button command passes in a value from the UI in the CommandParameter. This saves us having to reference controls directly from code. In this example, the selected person is used to make the value for public property TestText. This command is triggered AFTER the page has finished binding, so we target the public property, so the PropertyChanged event is triggered. This is so the bindings related to that property know that they need to update, otherwise changes will never be reflected in the UI. This second example shows a nice way to close a window from a ViewModel, using an Attached Behavior. The "close window" behavior is added from an attached property called DialogResult. This example shows the alternative to INotifyPropertyChanged - DependencyObject and Dependency Properties. Dependency Properties are considered a "richer" method of binding, as the Register method also has several overloads for PropertyChanged and Coerce delegate methods. The main drawback to Dependency Properties for general MVVM use is they need to be handled on the UI layer. This example also shows how a command can also control whether a button is enabled or not, through it's CanExecute delegate. This again moves away from controller and more into behavior. The action cannot even be triggered if conditions are not met, and this is clear to the user as the button is disabled. We are not using the command parameter in this example, but relying on a ViewModel property to be populated with the selected item. If there is none, the CanExecute method returns false, which disables the button. All encapsulated in the command, nice clean code. 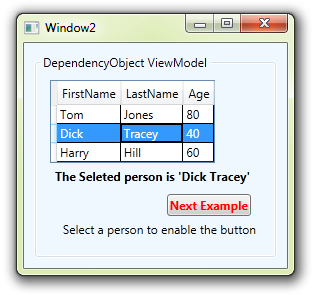 To close the window in this example, we still use the Attached Property in the Window XAML, but the property is a Dependency Property in the ViewModel. 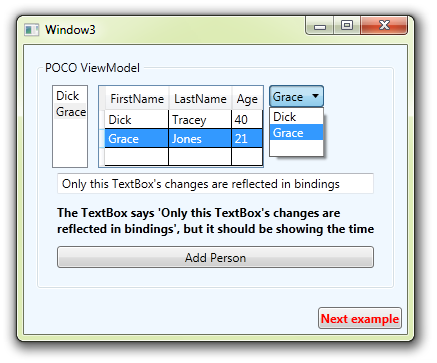 A POCO class in WPF/MVVM terms is one that does not provide any PropertyChanged events. This would usually be legacy code modules, or converting from WinForms. This next example demonstrates how things start to break, when you don't use PropertyChanged events. At first, everything seems fine. 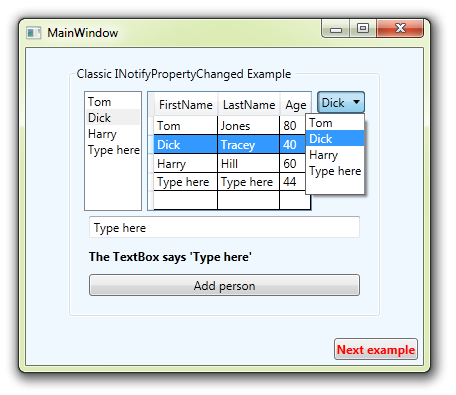 Selected item is updated in all, you can change properties of existing people, and add new people through the DataGrid. Those actions are all UI based actions, which change Dependency Properties like TextBox.Text, and automatically fire the PropertyChanged event. However, the TextBox should actually be showing a time stamp, as set by the code behind Dispatcher Timer. Furthermore, clicking the Button to add a new person does not seem to work, but it did. If you then try to add a user in the DataGrid, the binding updates, and shows the previously added user. All a bit broken. Just as an alternative, this ViewModel has a custom event, to signify closure, which is handled in code behind when the ViewModel is attached. The following window is almost identical to the previous POCO example. However TextProperty1 now triggers a PropertyChanged event in it's setter. Now you will find the time stamp property shows through onto the TextBox as shown below. The behaviour of closing a window, could happily be kept with the window, if you believe that is where it belongs. One way of always assuring any ViewModel has the expected event shown above would be to make our ViewModels (ideally in the ViewModelBase) inherit an interface that defines the event. We can then safely cast any ViewModel back to this interface, and attach a handler to the expected event. The most important message to learn from all of this is that if you can convert the base (model) classes that you use to INPC properties, DO SO NOW. You will save yourself a world of pain, unnecessary data marshalling through wrappers, and a whole load of code that can introduce bugs and dependencies to your implementation. But what if you have a Business Object that handles all the work, like an existing database module, or web service client? This may therefore be a "closed object" that you cannot enrich with INPC on it's properties. In this case you have to fall back on wrappers and polling. It also has a public POCO string property ReportTitle. Finally, there a "Status" enum (Offline, Online) which periodically toggles from a [background thread] Timer. Firstly, we need to marshal the data in and out of the business object. We need to wrap the data in marshalling properties. The public string property "Report Title" is a two-way pass-through wrapper (getter and setter). It marshals the values in and out. This takes us back to our first POCO example, where this is sufficient for some operations, but changes to the "back-end" data, will not automatically be reflected in the UI. There is a Label also bound to this property, but again it only works because the change was UI initiated, as explained in earlier examples. The final property (BoStatus) represents the business object "Status" property (personel.Status), but this value is constantly updated by another thread, so we would normally miss the updates in the user interface. The only answer is to poll the property for changes. BoStatus is therefore not a wrapper, but a store of the "last known" value. We use a Timer to frequently check the property for changes. This may seem expensive, but it's really not, in computer processor terms. When we detect a change, we update the Public property BoStatus, which saves the new value locally, and fires the PropertyChanged event. Anything consuming this property will update their bindings, and call the getter to pick up the new value. Using the CRUD methods of our business object is really down to your own personal design and implementation. However, as a final example, I included a very simple method for doing this, with practically no code! By master/detail, we mean there is a master list of objects. You then select a list item to get the item details in a separate box. By CRUD, we mean Create, Update and Delete functionality. The three things you do to objects in a collection, or a database. Normally, in a big application, we would design a stand-alone user control for an edit form, but here is a quick trick to produce the whole, fully wired edit form, using the ItemsTemplate for an ItemsControl. The ItemsSource is tied to the SelectedPerson property of our ViewModel. If you were just editing, and not adding new users, you could bind this directly to the SelectedItem property of the DataGrid, but you will see later why we don't. A BindingGroup is defined on the ItemsControl, which we use later to cancel or commit changes from the form. ItemsSource expects a collection, rather than SelectedItem (SelectedPerson). So to make this trick work, we use a simple converter to wrap the selected person into a collection. This method means that if there is no selected item, there is no edit form. This removes the need for visibility converters, or triggers to show & hide the form! Binding to properties of the selected person, is only the immediate DataContext of the generated item - direct and easy. This binding traverses back, looking for the first instance of the ItemsControl. We then refer to the properties via it's DataContext. To allow us to cancel an edit, the binding's UpdateSourceTrigger is changed to Explicit. This prevents any updates of the source data, until we manually call an Update on the bindings. Instead we are using the Binding Group we earlier attached to the ItemsControl. The trick to use this in an MVVM scenario is that this BindingGroup needs to be defined in the ViewModel, and passed INTO the ItemsControl, through binding. It needs to be already waiting, if it is to be used by the DataTemplate bindings. This is then just another property of our ViewModel, that we can use in the ViewModel and is updated from the UI, as bindings are created and destroyed by the ItemsControl. In our command handling methods, we can update or cancel the changes from our ViewModel. To add a new user, we simply create a new "placeholder" object into SelectedPerson. This shows and populates the form with the new user object, which we can fill in. This is why we bind the ItemsControl ItemsSource to SelectedPerson instead of directly to DataGrid.SelectedItem. If new user deleted/cancelled, we simply set SeletedPerson back to null, which disposes of the object. If existing user cancelled, we call CancelEdit on the BindingGroup. If new user saved, we call AddUser on the Business Object, then trigger PropertyChanged on the People collection, for a fresh list from the Business Object. If existing user deleted, we call DeleteUser on the Business Object, then trigger PropertyChanged on the People collection, for a fresh list from the Business Object. CommitEdit updates the properties in the existing collection, if you are updating an existing Person. It does not updating the list. CommitEdit will update the existing data and hence the user interface, so we don't need to request an update of the whole list. I hope this article has helped to explain the Role of PropertyChanged events in MVVM, and how to wire up your controls and navigation. Please give a couple of seconds, to rate/star the Gallery sample. Many more sample projects available HERE!! !